Check out some of the inventive ways modern couples are styling a Jewish wedding chuppah to grab some inspo for your own ceremony. 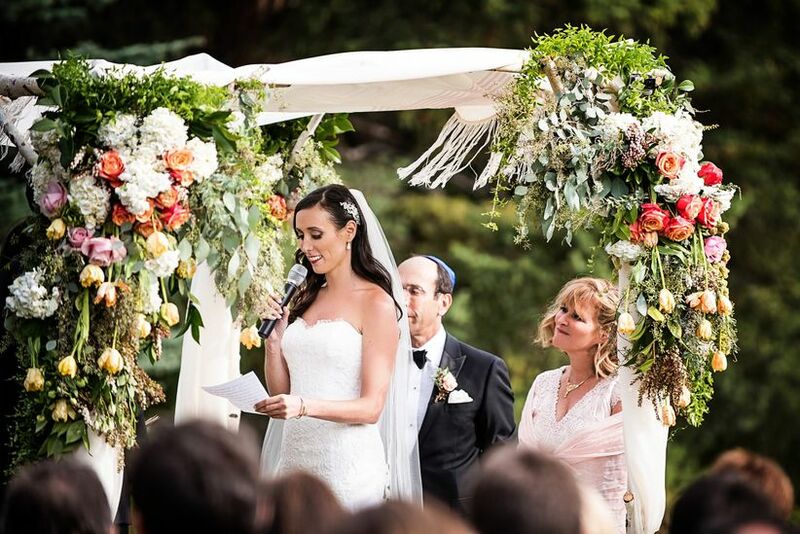 If you or your partner is Jewish, and you plan to host a Jewish wedding ceremony, you’ll want to think about ceremony structures. Most couples go for a Jewish wedding chuppah, an important and endearing Jewish wedding tradition. 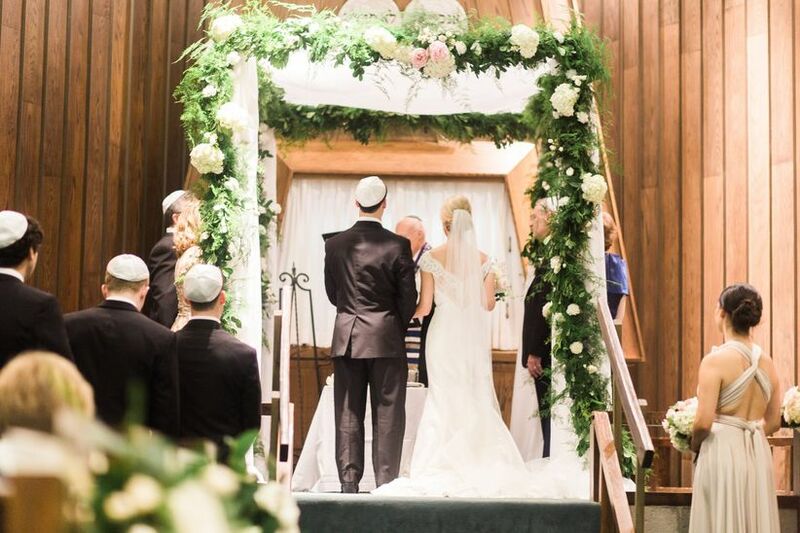 Chuppah, meaning Jewish wedding canopy or covering in Hebrew, represents you as a couple creating a Jewish home and offering your hospitality to your guests. 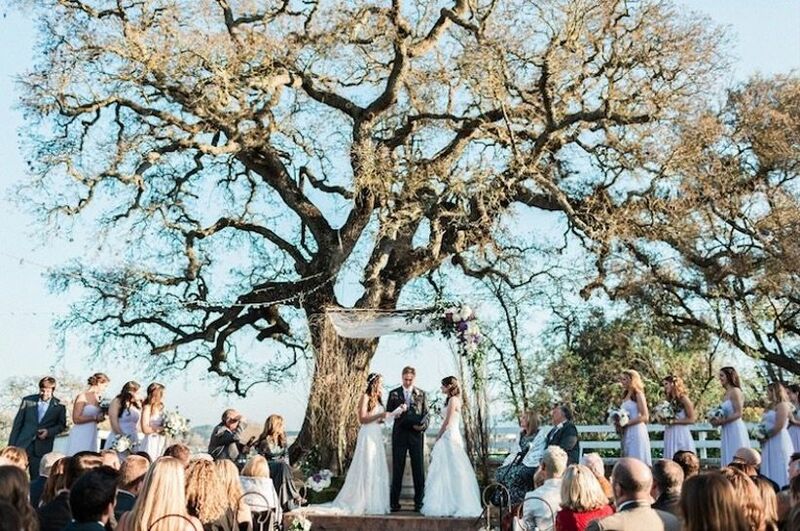 You, your officiant and your parents all stand under the canopy during the ceremony, while it’s optional for a best man and maid of honor to also stand underneath. Your Jewish wedding chuppah will maintain a traditional structure, but there are infinite possibilities to style it. 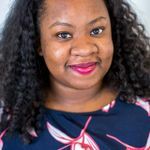 You’ll want to incorporate your wedding theme into your chuppah styling as well think styles that make sense for your venue type. Find inspiration for your Jewish wedding chuppah from these real weddings. Assembled with thin branches of wood, loosely covered with gauzy fabric and decked out with one bouquet of white and violet blooms, this outdoor barn ceremony’s Jewish wedding chuppah was the picture of rustic. This is a fitting way to style a chuppah for rustic, barn, farmhouse and other nature-inspired wedding themes and venues. If you’re hosting your wedding inside a synagogue, you’ll be styling the Jewish wedding chuppah provided for you. Don’t fight or try to upstage the timelessness of the temple’s decor, but rather work with classic, neutral shades and elegant hanging greenery to complement what’s already there. 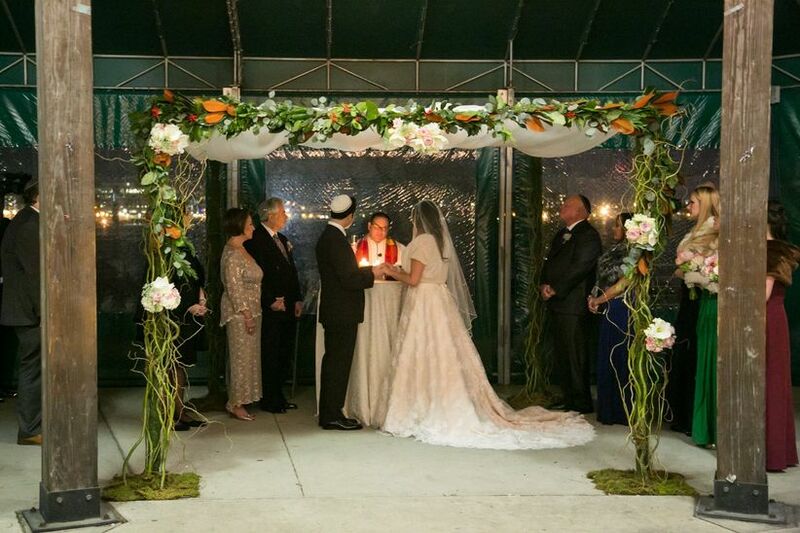 A different take on an outdoor Jewish wedding chuppah is this large wooden canopy made of exposed wooden branches. 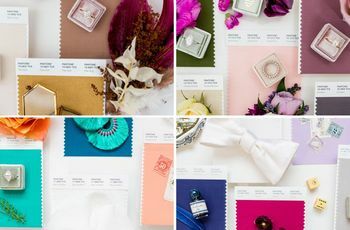 Colorful flowers and and plants offer a way to pull in the year’s flower trends and express the tone and mood of your wedding through color and shape. White gauze is draped over the chuppah along with a pink tallit. This is a versatile chuppah style that works for both indoor and outdoor venues and a variety of wedding details, including moody wedding colors and garden wedding details. 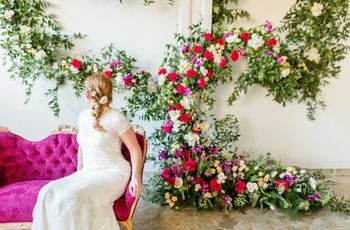 Cover your Jewish wedding chuppah in bold greenery and accent with glamorous white blooms for a just over-the-top-enough look. This Jewish wedding canopy style works well with outdoor ceremonies that have either a romantic mermaid theme or a gilded romance theme. 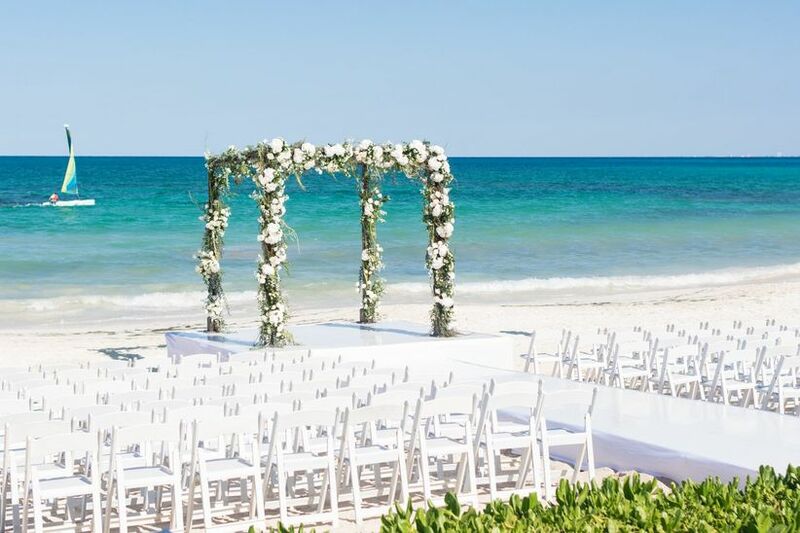 Beach and garden wedding venues alike are a fit for romantic chuppah styles, as the uncluttered waterfront or down-to-earth landscaped grounds won’t compete for attention. When you want what’s going on inside of your Jewish wedding chuppah to be the real star, choose minimal stylings that keep the focus on you and your partner. Clean, white silk drapings and minimalist floral arrangements full of trendy eucalyptus are all it takes to achieve the sleek look this wedding canopy. 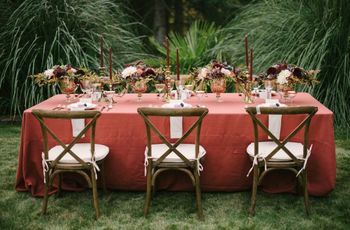 This style works well with venues and themes that are similarly sparse, like minimalist weddings and those hosted at industrial or loft wedding venues. Bright oranges, warm pinks and deep greens convey a thoroughly unstuffy vibe in this bohemian Jewish wedding chuppah. 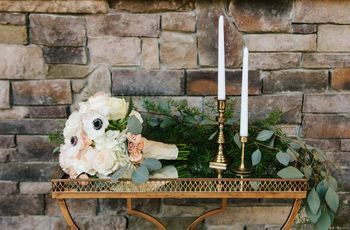 Don’t be afraid to big with color or even textured details with this style, which will blend best with an industrial chic venue and details. 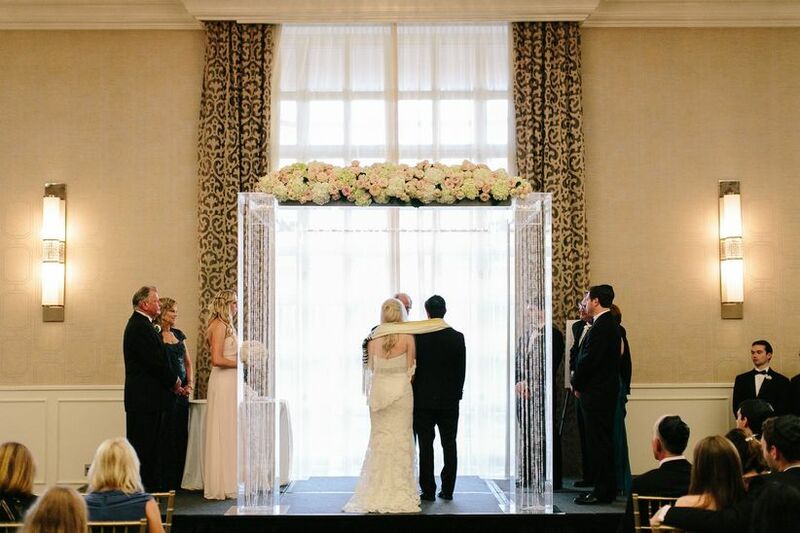 Ballrooms, glamorous hotels, country club venues and other lux venues are the best settings for a chic and feminine acrylic Jewish wedding chuppah. The clear, precise cut of the lucite acrylic canopy feels diamond-esque. Traditional fabric drapings are abandoned for clear beaded curtains that add a touch of sparkle. 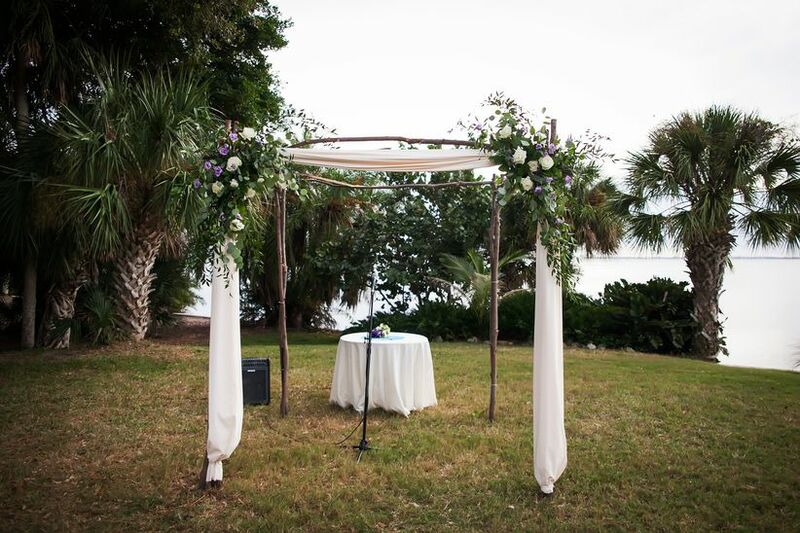 The chuppah is topped with a burst of white and pink blooms for a hint of color that doesn’t overpower.